What we’re seeing now may be the start of a sea change with AAA gaming companies. As late as last year, they were doing deplorable things with impunity, as if knowing their products will get bought anyway. We can keep going on with big bad capitalist monsters and sticking it to “The Man”, but this development affects both big and small. It’s just that when you see a giant putting things right, it’s a bit unexpected due to the norm. This post is about what has been going on lately, most likely due to the Steam refund policy. When the biggest digital games distribution platform finally put up a refund policy, the place went nuts. Some even expected it to go the way of the Dodo like what happened with paid mods. But with these recent happenings, they’ve been vindicated, at least for now. NOTE: Most of the following are the author’s opinions on the subject. It’s too early to tell whether the Steam refund system have really changed the landscape, but these early signs have been promising. Whether you’re optimistic or wary of things to come, this is fairly significant. Remember when it got announced? Remember the waves of panic from indie developers? That was just early this month, and it’s late June now. Look how much can change in a few weeks. There were also articles published in online gaming publications (bigger and more influential than this website… for now) reported abuse of the then-newly implemented policy, which was detrimental to indie developers. However, such articles may have been posted a bit too soon and the data presented had sample sizes too small to be of any statistical significance. Worries about it being abused with two-hour story games also arose. Titles like Gone Home, Limbo, Dear Esther, The Stanley Parable, and so on are seen by many as “not-games” and “walking simulators” that have no real gameplay, no failure states, and of relatively short length. Then you have something like Metal Gear Solid V: Ground Zeroes that actually is a “game”, but also pretty short. The refund policy’s long-term effect on these games remains to be seen. As days went by, more of the system started to make sense (there’s even a comprehensive guide) and it seems that Valve has done well with it so far. Then the Steam Summer Sale happened, which was its biggest test thus far. By the time it ended on June 22, there were no real horror stories and customers were pretty happy with how it’s working for them. Does anyone out there actually have a horror story with the Steam refund system? Let us know in the comment section below. As of late June 2015, it seems that Steam refund has had some positive effect. More gamers have been reporting the efficacy of the system in action. Then here came this year’s Assassin’s Creed: Unity. 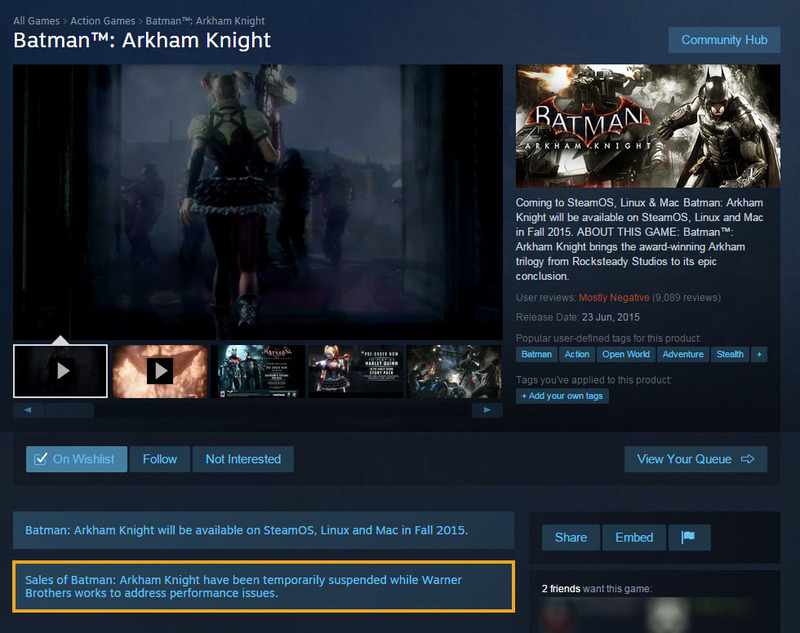 The PC version of Batman: Arkham Knight immediately garnered negative criticism due to its abysmal optimization. It had performance issues even on highly-specced rigs and worse on systems with SLI/Crossfire. More on that in this video report by TotalBiscuit. The whole thing with 30fps lock and so on adds to that. It sure runs on console, but you can’t edit the ini file to go beyond 30fps. It’s in my wishlist since I still want to play it. Waiting for GOTY edition. This was certainly done to stem the bleeding. Unlike Ubisoft only having to worry about fixing the problems and placating the gaming public during the whole AC: Unity launch debacle, Warner Bros. also had to watch their Steam sales figures being put on reverse by the refunds. Warner Bros. has issued a statement regarding this move on the WB Games Community Forums. 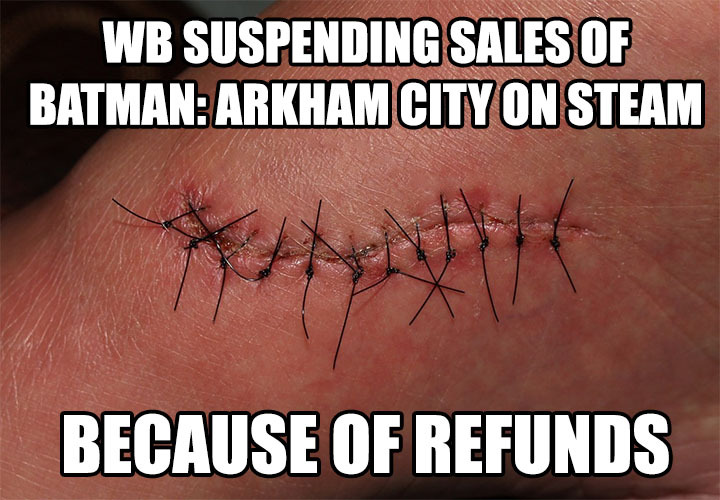 We’re not entirely sure how much this has cost WB, but it must have been quite a bit. Sorry for the disgusting imagery, but that’s basically how it is. Can this become the norm now? We could use more of this since Batman: Arkham Knight certainly won’t be the last game that gets launched in a broken state. But it may even make AAA companies more cautious from now on, as improbable as that may seem to cynics (like me). For now, we only have scenarios like this to tell us how the Steam refund system is doing. We’ll have to look again after a year, then two years, and so on to really get a good assessment of the long-term effects. But from what we’re seeing so far, the future looks promising as long as abuse can be kept minimal. Please leave whatever reactions, questions, or suggestions you may have on the comment section below. You may also leave a message on Facebook or Twitter. Thank you for dropping by.